Well this is the problem I'm having with this new tree image. Alpha mask I've tried upping the black by 3, no joy.. Its no different from the one that works as to the process I used to make it. From about 20 feet (estimate) the object becomes transparent.. Must be something I'm missing. OK so Blender only draws one side of a plane, so you have to duplicate the plane and flip the normals to get it to paint both sides for use in game. It seems as though MX Bikes doesn't like this. If I copy a plane, put it in it's original position and flip the normals to get a 2 sided face I get a ton of errors. So, when using a symmetrical tree, this works great.. When using a tree with an odd shape it doesn't work as well but that's something I can live with, and hardly noticeable once you rotate around. Wow.. and my guess is that as SketchUp DOES draw both sides of a plane, it does this by flipping the normal causing the errors. I don't think there's a way around that, but man oh man am I glad to have figured this one out.. I guess we're talking about the same amount of faces though, and even then I just did it with 2 image planes, so totaling 4 planes.. What's that, 8 tris? that's pretty good for a tree, I had about 200 with 8 planes last night and it didn't affect FPS one bit. Strange.. Got this working last night briefly then it all stopped.. Is something bugged? My guess is there is an order to it, or a vital step I'm not noticing.. Any hints? Joining the object and doubling it up works.. Seems like an expensive way to make 'low poly' trees, but then I guess we're talking about 16 planes instead of 8.. 16 planes per tree, 32 tri's.. I guess that's worth it for the good looks..
Hey PiBoSo / Snappe, I'd like to re-address this topic. When I started this topic I was working on the JS7 Compound. Back then, as you can see from my above message I only had to make a double sided X style tree and duplicate it in the exact same spot to make it 'solid' with no see through edges or weird alpha glitches. After that and in a later beta (6 - 7) I made Unadilla. When I first added trees on Unadilla (b6) I had to not only double up my tree but actually triple up to get them to behave. Now I'm working on Hawkstone.. 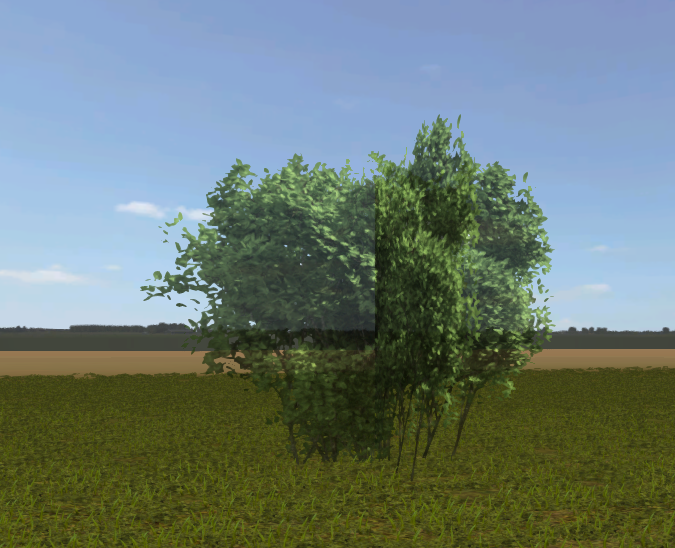 I've made my trees, duplicated them 3 times in the exact same spot and I'm getting alpha glitches. So my conclusion and the reason for ressurecting this old thread. It seems to be getting worse each beta. When you guys released the game with The Practice Track, Maryland and MXB Club your trees looked amazing and if you remember, I asked how they were done. Since you'e released other tracks over the course of the beta's your trees now all suffer with this alpha issue. You can even see it on the screenshot of Mantua used on the Tracks page..
Is this something that's ever going to be looked at? It looks horrendous and really brings the visual quality of the game down. Stock 3d grass has ALWAYS suffered with this as I've pointed out above. It seems to me that if it's getting worse, something is causing it, and if it can be fixed by duplicating the meshes then it's a sorting problem and not a bad texture problem. Seeing as the daily dev is filled with swathes of rendering fixes, do you think this could be one of them?